Stephanie started her health journey when she was a young girl watching her mother holistically over-come colitis after Doctors told her mom she'd be unwell the rest of her life and would always have to be near a toilet. She refused to believe this would be her future and took action to look into alternatives. At a Health Food Store she was advised by a 'Holistic Practitioner' to see a Colon Hydrotherapist. After several sessions of colonics, detoxing and dietary changes, her mom was on track to overall good health and over time her colitis healed. This inspired Stephanie to pursue a career in Colonics! She graduated from the 'Canadian School of Colon Hydrotherapy' in Toronto as well as just recently graduated from 'Wood Hygienic Institute, Inc.' in Orlando, Florida. 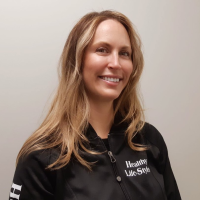 Since graduating Stephanie, is excited to announce that she has joined 'The Healthy Lifestyle' team and looks forward to helping others in their pursuit of good health. Aside from Stephanie's professional ambitions, family means the most to her and she is the mother of a 7 year old boy, AJ, who is the light of her life. Here at PURE D-Tox, we use a contained gravity – based system which provides a superior release and better overall colonic experience than any other system available today. We have a top of the line water filtration system and use disposable equipment for your safety. A gentle massaging of your abdomen during your session will lead to a more pleasant and complete elimination of waste. Also, de-stress as you detox with a 10 min complimentary Reflexology treatment with every colonic. Call and come in today. Stephanie will be happy to help you begin your journey to wellness in a dis-creet, professional environment because health and well being start from within!